Welcome to TracfoneReviewer, a blog about Tracfone. If you're new, be sure to have a look around and some of the other news and information we share! Don't you hate it when you lose signal while on the phone, or when you can't send a text because you are in a dead zone? In this post we look at how cell signal strength is measured, how to check your signal, and tips for improving it. We often get questions relating to signal strength, and hopefully this will help clear some of those up. Tracfone users several other cell phone networks, including Verizon and AT&T, and the coverage is usually pretty good in most cities and towns. However, there are plenty of places where the signal can be partially blocked, or has much further to travel. The information provided here is to help you get the most from your cell phone, so let's get started. Cell signal is measured in dBm (Decibel milliwatts) where about -60 dBm is a very excellent signal, and -110 very poor. Ranging between -70 and -98 dBm will usually result in a very adequate signal. As we will see further on in our tips for boosting signal strength, little things like holding the phone in certain ways, can significantly affect the signal. The signal strength bars at the top of your device don't have any standardized correlation to your actual signal strength, but are a general representation. Different phones may report a different number of signal strength bars even with a similar dBm number. So, for example, if two phones both have -93 dBm signal strength, one might show three bars and the other four. But how can you know what the actual signal strength is on your phone if you can only see the service bars? Well fortunately there is an easy way to check, for both iPhones and Android devices. Dial *3001#12345#* on your iPhone then press Call. The signal strength will be displayed in the top right corner. Once you see the number, try moving around or covering your phone with your hand, you should see the signal strength change. In our testing with a Moto G4, placing a hand over the top of the phone resulted in a loss of about 5 dBm signal strength. Below is the steps for checking your signal strength on an Android, but be aware it might be slightly different for you. Start by going to settings, and then scroll to the bottom, following the steps below. Now that you know how to check your signal strength, here are ten tips for improving it. 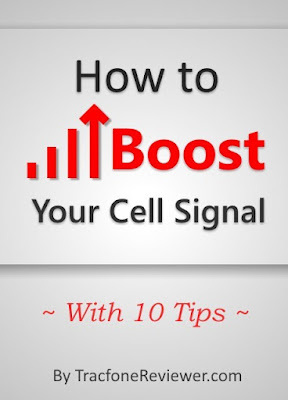 There are a number of different ways you can improve your cell signal and some of these may help more than others, depending on your situation. Anything that can block the radio waves reaching your phone could be reducing your signal strength. Things like a thick phone case, or leaving your phone in a purse or bag, could result in a worse signal, or even no signal. Test your phone case by checking your signal strength with it on, then off, and see if that makes a difference. Remember, closer to -60 is better, with anything between -70 to -100 still good, and beyond -110 very poor. If you notice your phone receives a lot of texts when you pull it out of your bag or purse, it could be getting blocked while in there. This may sound a little odd, but it can actually helps amplify the reception in certain cases. If you get a poor signal, and are located in the lower levels of a building or the basement, try placing your phone in a cup to boost the reception. It might be hard to make any calls, but you will at least be able to check texts and voicemail. This also works well for improving the sound of your phone. You can also test with other objects that can catch and funnel the waves to your phone. Cell phone manufactures put the antenna in a variety of different places, and sometimes the way you hold your phone could be reducing your signal. Check your signal strength with different ways you hold your phone and see if you might inadvertently be blocking the internal antenna. It can be helpful to walk around your house and check the signal strength in various parts. If you find a much stronger signal in certain areas, you can try and go there for making phone calls to help improve the signal. Going outside, and away from buildings that might be blocking your cell signal, can make a huge difference in improving the connection. If you need to make an important call and find yourself with a low signal inside, make a quick trip outside and it will likely improve. There are a number of free (and paid) apps that will show you where the nearest cell towers are, and which one you are currently using. This is very helpful if you need to get a better signal for an important call, or if you're just curious about where the cell towers are located. Open Signal is available for free from the Google Play store and displays the nearby towers, and which one you are currently connected to. 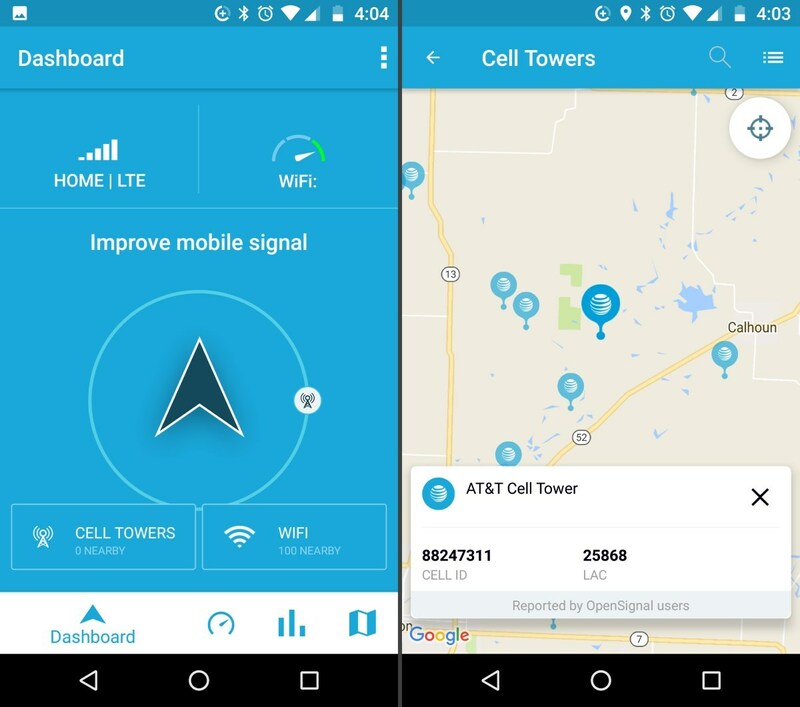 Take a look at the screenshots from the app: on the left, it shows the dashboard which indicates which direction the cell tower you are currently connected to is located, and the map on the right side shows all nearby cell towers. Cars are basically large metal boxes and they do a pretty good job of reducing your signal strength. If it is not too noisy, try opening your window to improve your service. Obviously, you shouldn't be driving and talking on the phone, so maybe consider pulling over. Using some everyday items you may be able to boost your signal with this DIY hack. There are lots of online guides and tips for creating and attaching signal boosters to your phone, but one we found was very simple, and made an improvement. Simply attach the charging cord to your phone, and then wrap the other end around a metal object, such as a pen, and hold it up in the air. Try it for yourself and see what kind of an improvement it makes for you. Constantly sending and receiving signals does use a lot of battery power, especially when your phone has a weak signal, it has to send and resend several times. Keeping the battery charged will help your phone have plenty of juice to keep sending information even at low signal strength. WiFi Calling works by using your home WiFi (or any WiFI) to transmit texts and calls for your device. You still have to pay for calls/texts, but at least you will be able to stay connected in locations with poor or no service. We've just created a full Guide to WiFi Calling with Tracfone which includes more details about how it works, and how to check if your phone is compatible. Cell phone signal boosters usually work by collecting the signal from outside your house, and sending it to another device that broadcasts it inside your house for a much stronger signal. They can be fairly expensive, sometimes several hundreds of dollars, but if you can't find another way to improve your poor signal inside, it may be an option worth looking into. WeBoost (available form Amazon) is one such option that offers several different solutions. If you live in an area with a weak signal, this could dramatically improve your signal. If you find that you still can't get a signal in places you commonly visit like your home or work, check with others to see if they have a better signal using a different network, and then consider switching. Tracfone uses several different networks, including Verizon and AT&T, so if you are using one service, you could consider switching to the other if you know that it has better service. 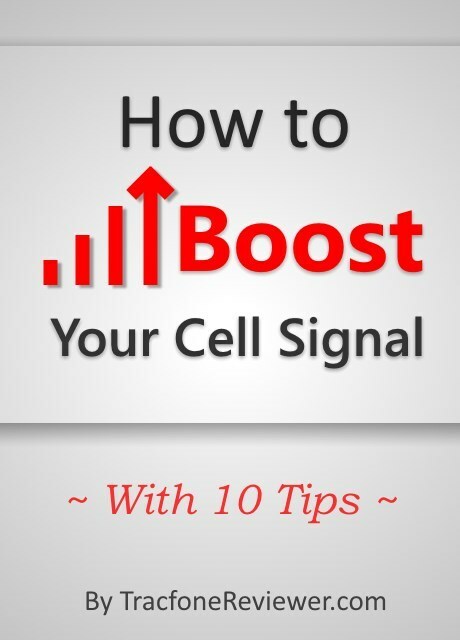 We hope this information about improving your cell signal helps boost yours! And let us know in the comments below if you have any thoughts or questions (and share your best signal boosting tips too!). Keep up with the latest news and updates by joining us on Facebook with over 2500 followers. Take a look at our Cell Phone Reviews list if you are considering a new phone, we've got lots of specs, details and where to buy the phones. See the latest list of Tracfone Deals, Discounts and Sales for the lowest prices on both Tracfone smartphones and unlocked devices. Is WiFi Calling Free? How does it work? We are here to help answer questions about WiFi Calling, and share an option for free calling using WiFi. If you're not sure how WiFi Calling works, if you have it or if you want it, this is the article to read. Information about WiFi Calling with Tracfone is not completely clear, but we've tried to collect and share the most accurate details below. If you have anything to add, or if we made a mistake, let us know in the comments. If you're new to TracfoneReviewer, take a look around. We offer lots of Tracfone related tips, news, info and reviews. A great place to start is our Beginners Guide to Tracfone. Now, let's take a look at WiFi Calling with Tracfone. WiFi Calling is a feature that allows you to send and receive both calls and texts over a WiFi network instead of the cell network. The main benefit is that you can stay connected with calls/texts when cell service is not available but WiFi is, such as in the basement of a large building, or in a rural area. WiFi Calling doesn't give you the ability to make free calls and texts. (Read further along to learn how to do this with Google Voice.) You are still charged the normal rate for calls and texts by Tracfone. WiFi Calling works on both Android and iOS devices, although not all phones support it, and not all cell phone service providers support it. Tracfone does support WiFi Calling, but only on some smartphones, and certain BYOP devices. It appears to depend on the phone and your location, as not all the networks Tracfone users support WiFi Calling. The first two requirements can be a little tricky to figure out. The easiest way is to just try and enable WiFi Calling to see if it will work. Tracfone uses several other cell phone networks, and a variety of different smartphones, so not all are capable or compatible. You can visit https://e911-reg.tracfone.com/wps/portal/home/ and enter your phone number and last four digits of your SIM card number (located on your SIM card for BYOP devices). Testing with an unlocked Moto G4 Plus with GSM SIM was unsuccessful. Enable WiFi Calling on your device (if it isn't already enabled) by going to Settings > More > WiFi Calling. 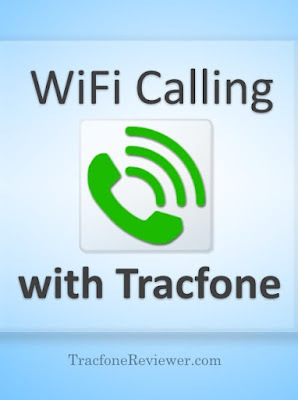 Here is a Tracfone tutorial for enabling WiFi Calling. If you run into problems, try double checking each step and if that doesn't work, contact Tracfone directly or leave a comment below. If you're phone is capable of WiFi Calling, it should be a fairly quick and easy process to enable it. But what if you can't enable WiFi Calling, or you want to make free calls using WiFi? Well we've got the answer! If you were expecting WiFi Calling to make it possible to make free calls and texts, you are probably disappointed. But don't worry, there are other options for free calling and texting, and we will share one of the more popular methods here. Using Google Hangouts/Hangouts Dialer and a free phone number from Google Voice, you can make free calls from WiFi. Anyone you call will see your Google Voice number, not your Tracfone number, but you can port your Tracfone number to Google Voice if you prefer that. Visit Google Voice and sign up for a free phone number. You are able to choose a phone number from a large variety available from many different area codes. Make a Test Call using the Google Hangouts Dialer app to check that everything is working. Now you should be able to send and receive phone calls to your Tracfone smartphone using your Google Voice phone number and the Dialer app. Here is a helpful YouTube video that also explains more about Google Hangouts Dialer and how it works. If you are looking for free texting, there are a number of texting apps such as Whatsapp, Line App, and more, that allow free texting with anyone else who also has the app. Using a Google Voice number and the Hangouts Dialer app is a great way for anyone to make calls using WiFi without using any Tracfone airtime. We hope this information is helpful and leave a comment with any thoughts or questions. Check out the latest Tracfone Deals, Discounts and Sales if you are shopping for a new phone, or just want to see what is available. Also take a look at our List of the Best Apps for Android, which includes several free texting apps. And learn which Tracfone Airtime Card is the Best Deal with our comparison guide. Below are some of the best deals on Tracfone smartphones, regular phones, bundles and airtime. We know it can be a challenge to find the best price on a new cell phone, so we track, collect and share some of the best deals here for you. Tracfone cell phones can be purchased not only from the Tracfone website, but also through many retailers like Walmart, Amazon, eBay and more. The best deal on a Tracfone device is to purchase a bundle which also includes airtime. In some cases you can get a new phone for very cheap, or even free with the purchase of airtime. Be sure to also share any big discounts you find in the comments below. Let's get started. While the LG Rebel is a fairly basic smartphone, with Android 5.1, 8 GB memory and a 5" touchscreen, this bundle is very good. The airtime, a 1 Year service plus 1350 talk, text and data is worth over $100,, plus you get the phone for free. Visit our Review of the LG Treasure to learn more about this phone. The Galaxy Luna is a popular phone choice for its overall performance. It has a 4.5" screen, Android 6.0, quad core processor and 8 GB memory. It is generally best for people who use a small handful of apps, but don't do much more than that. This is a very good deal, as the Airtime bundle is worth $99, making the phone ($80-100 value) free!. View our review of the Samsung Galaxy Luna to learn more. View the Deal on eBay. The Galaxy Core Prime is about a year old, but still offers some good features including a 4.5" touchscreen, 8 GB Memory, Quad-core processor and Android 4.4. The airtime is worth $99, making this a great deal. Note, the airtime may come pre-installed on the phone, meaning you can't immediately use the airtime on another device. View our review of the Samsung Galaxy Core Prime for more information. These are great phones at a low price and ready for the Tracfone BYOP program. If you want lots of onboard memory, a large, beautiful HD screen and long battery life, the Moto G4 Plus is an excellent option. It comes with Android 6.0 (upgradable to 7.0), 5.5" screen, 64 GB memory and plenty of other great features. The retail price is $299, but this deal has it available for $239. Check out our review of the Moto G4 Plus including adding it to Tracfone BYOP. Share any deals you find in the comments below and we will add them to the list! Take a look at our recent Comparison of Tracfone Airtime which includes details on the cheapest ways to add airtime, and the best value cards. We also updated our list of the Best Apps for Android. And don't forget to join us on Facebook where we have a growing community of helpful people who share info, ask questions and give answers. 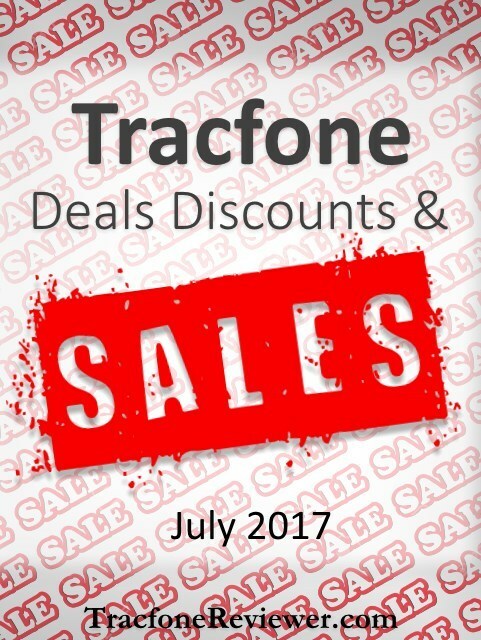 Welcome to TracfoneReviewer, we share the latest news, information and reviews about Tracfone! New promotional codes are available for July and we have them below! 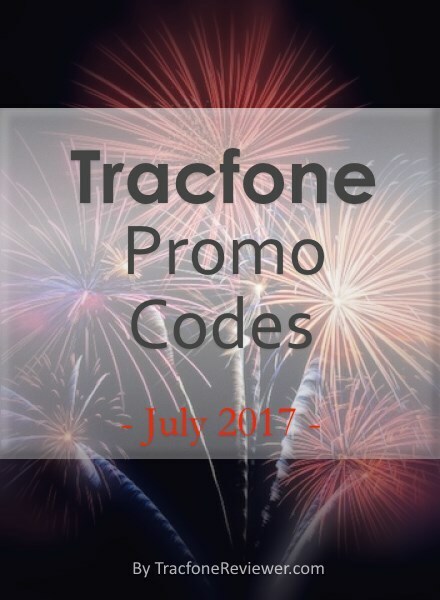 Tracfone provides these codes for customers to use and get extra airtime for free. Most codes are for a certain airtime card, but may be used with cards of greater value. Each month we collect and share the latest promo codes here with our readers. The codes are listed below, free to view and share, with nothing to click. You can also view our full list on our main Tracfone promo code page. To use these codes, simply find a code that corresponds to your airtime card, and enter it when prompted either on your phone, or on the Tracfone website. Some codes can be used multiple times, while others are one time use. Promo codes are working on most smartphones, such as the newly released Samsung Galaxy Sky Pro. Codes should also work on any BYOP devices. Follow the links above to learn more about these phones and options. Now let's get to the codes! Here are the latest codes, to ensure a code works, add your airtime over the phone. These are the latest promo codes for July 2017, leave a comment below and let us know which code you used. 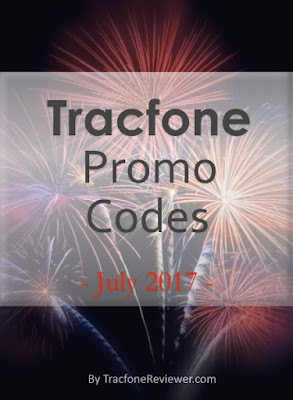 We also have a larger list of promo codes on our main Tracfone Promo Code page. If you are still unfamiliar with how Tracfone works, take a look at our Beginners Guide to Tracfone which covers a number of the basics of Tracfone airtime, phones and service. See the latest list of Deals and Sales on Tracfone cell phones which includes some great bundle deals for airtime! Keep up with all the latest news, deals and posts by following us on Facebook with a helpful community of over 2500.